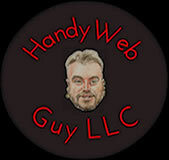 Domain Services - Handy Web Guy LLC "At Your Service" - Custom Web Platforms Built Just For YOU! Contact us if you need assistance in finding an ideal name for your personal or business needs. With many years of experience in domain registrations, we can help you find the best (and often shortest) domain name possible, and avoid some common mistakes as well! Get your domain today with the Handy Web Guy's easy to use domain service. Tired of your old registrar? The Handy Web Guy will assist you in every step of your domain transfer to it's new home.